Schools (especially elementary and preschools) are a cesspool of mucus, urine, germs, and viruses waiting to grab hold of unsuspecting victims. I’ve been in them for a long time (my whole life, really), and have felt their wrath, occasionally. In spite of the hundreds of times when a child has (hopefully accidentally) sent spittles into my mouth, nose, and eyes, I get sick rarely. It seems a miracle when you really think about it. As a speech-language pathologist, my face is often 12 inches or less away from young children. I touch the same iPad that they have just touched, after putting their hands down their pants. I help them wipe snot off their faces. I even (gasp) hold their hand. Do not misinterpret the advice that I am going to give as the new “cure” for illness. Even as I write this post, I am recovering from my first cold of the year. But considering all that I put my body through, getting through 9 months without any cold before this is pretty darn amazing. Please note that Amazon Affiliate links are included in this post. 1. Vitamin C is a must whenever you around sickies (i.e., all of the time). My favorite is Emergen-C.
2. Sanitize everything. As soon as a student has touched something, I grab hold of my Clorox wipes or gel sanitizer and wipe it down. 3. Wash your hands. I rarely use gel sanitizer on my hands because I have sensory issues to the smell and feel of the sanitizer. Besides, hand washing is the only way to effectively remove dirt and grime. So instead of using sanitizer all day, I wash my hands approximately once an hour during the school day. 4. Exercise daily. Some teachers that I work with easily get 10,000 steps just doing their jobs. If that is you, then give yourself a pat on the back and don’t even worry about this tip. If this is not you, however, then make a plan. Before or after school each day put on your tennis shoes and start moving: take a walk, go for a run, lift some weights, dance. Right now I am using my Fitbit Charge 2 to reach my goal. My present goal is 15,000 steps per day using a combination of all of these tips. 5. Sleep. Aim for eight or more hours per night. Seriously. When you combine the sleep needs with the exercise needs, it means that I go to bed by 9 pm. And that’s okay. Give yourself many, many hours (at least 1/3 of your day) to recover in bed from your tough day. Studies show that lack of sleep affects your immune system. Don’t be a statistic. Sleep! 6. Get your flu shot. Although not perfect, the flu shot is currently believed to lower your risk by 50-60% (source here). We often forget that the flu kills. We are lucky enough to have not lived through a major epidemic, however, pandemics are real. In 1918, 50-100 million people worldwide DIED of influenza. As a healthy adult, I feel it is in both my best interests and the interests of my medically compromised students to get my shot. In addition to these commonly known tips, I have developed some less known healthy routines. 1. Shower after work. I realize that many people feel the need to shower in the morning in order to wake up, make their hair perfect, etc. And maybe you can do that with a quick rinse off. However, if you really want to get the grime, spit, dirt, and general nastiness of the school off of you, take a hot full shower after work. I don’t believe this tip is research-based, however, it just makes sense. Plus, who wants to go to bed with all of those sickness producing viruses and bacteria all over their body? 2. Take an “I think I’m getting sick” day. Don’t wait until the symptoms have hit you hard before finally calling in sick (likely for multiple days by that point). If you are able, try to rest up as soon as the symptoms begin so that you can recover quickly. 3. Do not share your pens. I carry my pens in my apron pocket and I am wary of lending a pen to anyone. In addition, I rarely will use other’s pens. To protect myself from whatever is on other’s hands, I try to stick to my own stuff. 4. Use your sleeves and elbows. Along with not wanting to touch the pens of others, I keep my fingers away from doorknobs, light switches, and sink faucets. When I cannot use my elbows to access these items, I use my long sleeves or apron. If you have ever swabbed one of these in high school science class, you will be aware of how saturated these are with microbes. 5. Wipe down your tables and shared surfaces. Very few of us have the time or energy to wipe down every student desk. We can, however, quickly wipe down the table that we use for small group reading, therapy time, or other teacher/student interactions. 6. Teach your students to cough and sneeze into their elbows. I go out of my way to compliment students that I find doing this. Once you see videos of how far coughs and sneezes travel, you’ll understand why this is important. Then make sure they wash their hands immediately and remind them to keep washing all day long. While you are reminding them, take that time to wash your own hands an extra time! 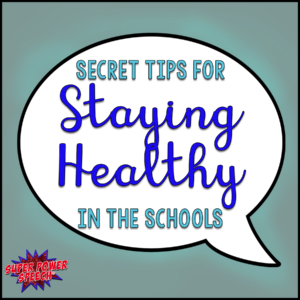 These are my tips for staying healthy during the school year. What are your secret tips? I’ve been working with kids one way or another for close to 30 years. I’m far too lazy to wipe everything down every time it gets touched. I hate how dry my hands get with gel sanitizer, and I’m more than a little concerned about sanitizers+antibiotic soaps=>antibiotic-resistant superbugs. I’ve adopted a “roll with it” attitude. My illnesses stem from stress at least as much as kid (and parent!) germs. I get one, maybe two colds a year. I figure it’s just part of being a service provider. I try to be sensible and wash my hands, have the kids cover their coughs and sneezes, have the kids wash their hands, wipe down surfaces after we use them, and encourage families to stay home when parents or my kids are sick. Other than that, it’s too much stress to worry about, and I don’t need the stress making me more susceptible to colds. “Spittles” – I love it! Another idea – teach them personal space & the importance of it! Great social skill for them, great health benefit for me! !